(in the same time slot as the original series had been aired). Although it began just one week after Jinzo Ningen Kikaida it was supposed to take place 3 years after the defeat of the Dark Destruction Corps. 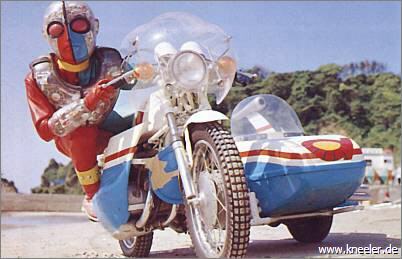 Kikaida uses his Sidemachine, motorcycle, with sidecar, as a weapon, attempting to run down the Dark Destruction Corp androids and robotic monsters. It can also fly. The sidecar is useful in carrying people he's rescued. In one episode a rotating blade comes out of the sidecar wheel to tear up the tire on a truck being driven by a Dark android. 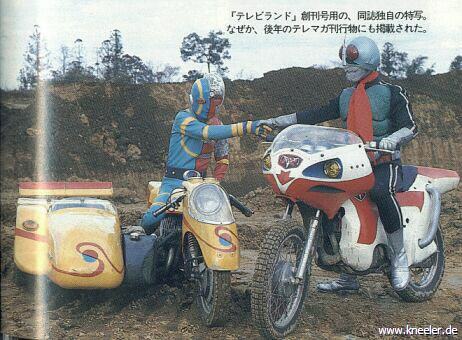 When Kikaida is in Jiro form the motorcycle reverts to an ordinary looking motorcycle with the sidecar, on the opposite side. In this form it's called the SideCar. (Look closely at the picture, Jiro's cycle is in the background.) 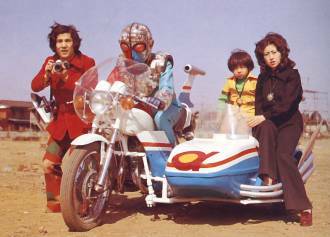 In one episode Jiro flips a couple switches which causes the Sidecar to drive itself so he can jump off it, Masaru was in the sidecar. In episodess 37 & 43 Jiro whistles and it comes to him. In Kikaida-01 Jiro drived Sidemachine only. In episode 9 of Kikaida-01 Jiro drove Sidemachine on water. Sidemachine's license plate number was 0010.